... oh yes. Just as every newspaper columnist eventually gets round to writing a column about how difficult they found it to write their column this week, so every blogger eventually gets around to telling you about their dream they had last night. Well, last night I dreamed I was having an affair with David Attenborough. 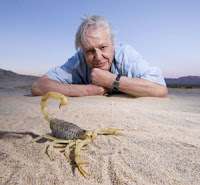 Proper David Attenborough, as he is now, like, not some dream version of him where he is labeled "David Attenborough" but actually looks like Jon Hamm. I can think of several reasons why this is appealing. First, who doesn't love David Attenborough? Would his voice not bring you out of a coma, if you were in one? And he's taken on a new, battling persona since the news emerged of the hate mail he receives from creationists. He's also the guardian of all animals in the world, as we know, and is on personal chatting terms with many endangered species, many of whom I'm very worried about at the moment. David Attenborough is also the king (inasmuch as we believe in kings) of the non-speciesist humanists. He is always at pains to point out that although we appear, to ourselves, to be the pinnacle of evolution, we're nothing like it. It's this kind of talk that makes me more convinced than ever that people like Giles Coren are wronger than someone who answers "fourteen" to "what's ten plus two?" when they express the belief that pets are unnecessary and should be discarded. I can get behind the point of activists like Peter Singer that it's wrong for their sakes to keep animals, but I am sentimental about animals (which I realise is a stupid trait, but hey, some people believe in God or football teams. We all have our coping mechanisms). I also believe that it's good for people, and indeed, other animals, to live with different types of animals. I believe it teaches you something. Even if all it teaches you is that you don't like people very much sometimes. Particularly when they send threatening mail to David Attenborough. I love David Attenborough too. I found myself tearing up watching the Great Salmon Run last night in his new Great Natural Events series. It was just marvelously moving and engaging television. I'd feed Giles Coren to a hungry grizzly bear. It just seems like the right thing to do.